Even with today’s communications tools many dentist and lab technicians never truly communicate. The result is not only frustration but can result in an inferior product. In this two-part program we will follow a full upper arch case from beginning to end. 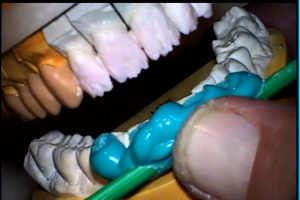 Dr. Tom Trinkner demonstrates a conservative preparation while ceramist Matt Roberts demonstrates the time it takes to build a single tooth and why records like a stick bite and digital pictures are so important. Describe how the information that the dentist gives to the ceramist produces a better restoration. Understand how the restorations are built up. Discuss the steps taken when seating the final restorations. V. Placement of the finals. Part 1 - Anterior build up continues to take shape. Lab technician Matt Roberts continues to build up the anterior restorations. Part 2 - Matt Roberts begins the internal effects on the anterior. Lab technician Matt Roberts begins the internal effects on tha anterior restorations. Part 3 - Completion of the anteriors and why contours are so important. Part 4 - Matt Roberts begins the posterior build up. Part 5 - Dr. Tom Trinkner seats the final restorations. Dr. Tom Trinkner seats the final restorations.